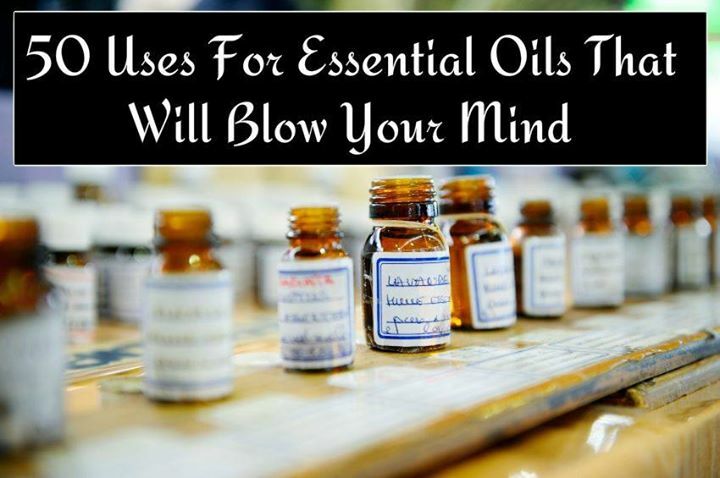 There are seemingly endless choices when it comes to buying essential oils and for every oil, there are at least a dozen uses. From blends to the basics, here we’ll give you some great ideas for just what to do with that impressive collection growing in your cabinet. Need some essential oils to add to your collection? Add this 14 bottle essential oil set from Plant Therapy to your collection, or for a more serious selection, try this 32 bottle “Ultimate” set from Eden’s Garden. 6. Freshen Bathrooms with Lemon, Grapefruit, Lavender, Rosemary, or Geranium oil in adiffuser. 9. Neutralize Pet Odor with Geranium, Lavender, or Lemon oil. Mix ten to twenty drops of essential oil in a small spray bottle filled with apple cider vinegar. Shake well before each use. 11. Dissolve Stubborn Substances like wax, oil, chewing gum, or glue with Lemon oil. 12. Scrub Sinks with a mixture of Bergamot and Lime oils diluted in water. 13. Scent Your Vacuum Bag by dousing a cotton ball with your favorite essential oil and dropping it into the vacuum bag or filter. 14. Wash Fruit and preserve its freshness with Grapefruit oil. 15. Repel Spiders and Rodents by spraying Peppermint oil mixed in water around windows and doors. Douse a cotton ball with Peppermint oil and stuff into corners of windows where spiders may be able to enter. Use the same method anywhere you think rodents might be able to access your home. 16. Neutralize Paint Odor with 10 ml of Peppermint oil added to a can of fresh paint. 17. Scent Your Bath Towels by sprinkling a dozen or so drops of a favorite oil onto a small piece of terry cloth and toss it in the dryer with clean towels. 18. Remove Mites from Bedding with a few drops of Eucalyptus oil mixed with water and added to the washing machine. 19. Add Aroma to Your Fireplace by applying ten or so drops of essential oil to a dry log. Allow the oil to permeate the wood for at least a couple of days before burning. 20. Transform a Candle by adding a few drops of essential oil to the hot melted wax near the wick after the candle has been burning for a few minutes. 21. Freshen the Air by adding twenty drops of your favorite oil to a small spray bottle filled with water. Spray as desired and always remember to shake well before each use. 22. Lighten the Mood in a room with Lavender, Rose, Ylang Ylang, Roman Chamomile, or Orange oil added to a diffuser. 23. Relax Your Mind and Body by adding Chamomile, Lavender, Bergamot, or Cedarwood oil to your bath water. 24. Scent Your Whole Home with your favorite essential oil or blend of oils sprinkled onto the new furnace filter each month. 26. Stay Alert while driving or studying by inhaling the scent of any combination of Lavender, Sage, Frankincense, Lemon, Peppermint, Lemongrass, and/or Basil oils. 27. Unwind After a Hard Day by dropping Basil, Grapefruit, or Peppermint oil into a candle-powered oil burner. 28. Invigorate Your Office with Ylang Ylang, Basil, Orange, or Jasmine oil added to adiffuser. 29. Create a Relaxing Environment in your break room or lobby using Chamomile, Lavender, Bergamot, or Cedarwood in a diffuser. 30. Scent Letters and Cards with fragrant essential oils that complement a holiday or special occasion. 31. Liven Up Silk Flowers with a matching floral essential oil. Mix oil with water in a small spray bottle, shake well, and apply to flowers. Refresh as needed. 32. Cure Nausea with Ginger or Nutmeg oil. Rub a few drops on soles of feet and relax until nausea passes. 33. Soak Sore Feet in Peppermint oil added to an Epsom salt foot bath. 34. Bolster Your Immune System with Oregano oil rubbed on the bottoms of feet. 35. Relieve Menstrual Cramps with one part Clary Sage, Basil, or Rosemary oil mixed with four parts carrier oil. Massage into abdomen and cover with a warm compress for fifteen minutes. Repeat as needed. 36. Soothe a Headache by mixing two drops each of Peppermint, Eucalyptus, and Lavender oil per six drops of carrier oil. Massage into temples, behind ears, on back of neck, across forehead, and under nose for quick relief. 37. Open Your Airways by inhaling the vapor of Eucalyptus and Lavender oils mixed equal parts with a carrier oil. Rub onto chest before bed for a better night’s sleep. 38. Avoid Germs While Traveling by packing a small spray bottle containing equal parts Cinnamon, Clove, Eucalyptus, Lemon, and Rosemary oils diluted in water. Shake well before each use. 39. Stop Hair Loss with Burdock Root, Ginger, Hops flower, Lavender, Rosemary, Thyme, or Yarrow oils mixed with a carrier. For more information, check out the Top 10 Remedies for Thinning Hair. 40. Detoxify Your Body by soaking in a warm Epsom salt bath infused with Rosemary and Juniper oils. 41. Disinfect Cuts and Scrapes with Lavender or Tea Tree oil. Dilute one-to-one in a carrier oil for those with sensitive skin. 42. Reduce Fever by adding equal parts Sage, Frankincense, and either Peppermint, Eucalyptus, Pine, or Rosemary oil to a bath. Add the same oils to lukewarm water and sponge onto feverish skin. 43. Relieve Tension by massaging a few drops of Lavender oil under the ear just behind the jaw, into temples, and over stiff neck muscles. 44. Relax Tired Muscles with Eucalyptus, Sage, and Basil oils added to a warm Epsom salt bath. 45. Say “Goodnight” to Insomnia by sprinkling Chamomile and Lavender oils onto your pillow. Add several drops of both oils to a cotton ball and keep near your head while resting. 46. Loosen Stiff Joints with a couple of drops Wintergreen, Juniper, or Vetiver oil mixed with about a teaspoon of carrier oil. Gently massage into achy joints. 47. Protect Skin from Sunburn by mixing one part Myrrh oil, one part Carrot oil, and two parts Jojoba oil. Apply liberally for sun protection equivalent to SPF 30. 48. Deodorize Upholstery with Geranium, Lavender, Lemon, Peppermint, or Ylang Ylang oil in baking soda. Dust on, let set for a few minutes, then vacuum off. 49. Air Condition-Air Freshen by clipping a cotton ball in front of an air vent and adding a few drops of your favorite oil. 50. Have a Little Fun. Cut two identical pine trees out of green felt and another out of paperboard. Glue felt to both sides of paperboard and hang from your rear-view mirror. Scent with pine oil and refresh as needed.